Utilizing custom domains allows you to create a memorable URL for your AdvocateHub. It makes the experience of visiting more seamless. Allowing advocates to navigate to ‘advocates.yourcompany.com’ or 'vip.yourcompany.com' creates a branded experience. As a general rule, this custom domain should be a subdomain of your company's domain - e.g. http://hub.mydomain.com (where hub is the subdomain). Note: When logged in as an administrator, your custom domain will not be visible. You will always see the *.influitive.com domain. Further, advocates will be directed to the *.influitive.com for the login and sign up pages. Once logged in, they will always see your custom domain. Once you decide on a custom domain URL, speak with your IT department. 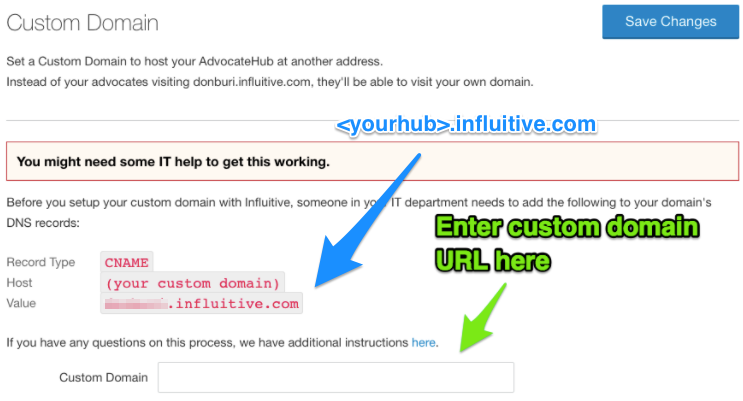 They will need to add your AdvocateHub’s URL (<hub>.influitive.com) as the DNS record in the form of a CNAME record. Important! Never use an A record to set up your custom domain. Only CNAME records are supported. A records or IP records may break if there are server or hosting changes on our end. CNAME will always work. Inform Influitive of your newly created custom domain before proceeding. To ensure secure transport of information between your advocates and Influitive, we are required to configure an SSL/TLS certificate for your custom domain. This will mean that your advocates will be going to https://customdomain.yourdomain.com. This is a relatively quick process, but Influitive must be informed first, in order to kick start the process. Let your CSM know or contact Influitive Support. Once Influitive Support has applied the SSL certificate, visit your custom domain settings. Head to Settings > Advocate Program > Custom Domain. Next, enter your custom domain URL in the text area. Please note that you should not include http:// or www when entering your custom domain URL. An example URL to enter is 'thisisright.yourcompanyhere.com'. The process is a bit different than using a subdomain. Please follow these steps closely to ensure advocates can get to your Hub regardless of whether or not they use mycommunity.com or www.mycommunity.com. 2. Set up a redirect for the naked domain (i.e. the domain without www) so it will always go to the www. version - thus redirect to your Hub correctly.